The motto of western science may be: to freedom and back again. In his magisterial examination of Western culture, historian Jacques Barzun suggests that what makes the West “the West” is that for 500 years (from approximately the Renaissance to the present) a group of related cultures came together on a joint project that led to the development of shared value propositions. They went to war with each other(a lot), they were mortal enemies, they developed new means of killing each other – but they also stumbled together towards the development of ideals like Individualism, Nationalism, Abstraction, Scientism, and others truths that we now hold to be self-evident. The most developed of these ideals, Barzun posits, is: Emancipation. It began as a project of nations and theologies – to be emancipated from empire, pope, and priest – and then extended to political personhood, declaring that even a king cannot treat a free man unjustly. Its seeming culmination was the emancipation of slaves and the acknowledgement that they, like the nations they lived in, were capable of self-determination. But the project of emancipation wasn’t done, and it came to be applied to culture itself: for much of the 20th century the aim of psychology was to undercut the cultural demands that kept people from finding happiness. Just as political emancipation followed national, sexual emancipation followed political. The last 50 years of Western history have seen the same project of emancipation as the first fifty: the ratification of the notion that we make choices, and that our ability to do so is fundamental. But in some areas mainstream science is seeking to undercut emancipation. The very notion that human beings make choices in any meaningful sense is not a popular one in evolutionary psychology, which assumes we do what our ancestors were programmed to do by their environment 50,000 years ago, or in neural biology, which assumes that we do what our neurons tell us when they unconsciously fire in response to stimuli. We don’t make choices, these popular branches of science are saying: we do what we’re told by the parts of our body that really matter: genes, neurons, and neurotransmitters. The message is that you are not emancipated, and never can be. Nowhere is this view more obvious, or obnoxious, than in the reams of studies and popular science books purporting to explain how Republicans and Democrats are different at a biological level. They can’t help it, don’t you see: their brains are different! It’s not like they’re making a choice! It’s worth noting that there can be no notion more poisonous to the project of Western society than this: it removes the ideal of self-determination from consideration and replaces it with a new theology – better living through science – that is far more liberal but far less emancipated than the confession booth of the Middle Ages. In the Middle Ages you were still understood to be making a choice for the sake of your soul. Modern science denies every part of that sentence. Indeed the closer one looks at the idea that “Republicans” and “Democrats” are biological descriptions, the more it starts to resemble phrenology. … all of which leads one to wonder “which is it?” And, of course, whether these biological differences (if they really do hold up to repeat study) are a cause or an effect. And (this seems important) whether they can in fact change, like the swing voter who identified as a Democrat in 2008 and a Republican in 2010. The behavior exists: are we really postulating a massive brain difference in under two years in every swing voter? Does Occam’s razor really suggest that an Ohio factory worker who votes one way before his plant is shut down and one way after has had a neuropsychological transformation? Ferreiro is right to point out that these studies haven’t gotten us anywhere: but he only raises them in order to promote the explanation de jour. It’s evolution! (Again). Greatly simplified, his argument is that two rival evolutionary forces drive human behavior: first, individual selection, which rewards the fittest individuals by passing along their genes; and second, group selection, in which the communities that work best together come to dominate the gene pool. Wilson argues that these two evolutionary forces are at work simultaneously, so that both self-serving and altruistic behaviors are constantly competing at the individual and at the group level. As he explains, “Members of the same group compete with one another in a manner that leads to self-serving behavior …. At the higher level, groups compete with groups, favoring cooperative social traits among members of the same group.” In other words, individuals with self-serving behaviors beat altruistic individuals, while groups of altruists beat groups of individuals with self-serving behaviors. Extending Wilson’s work, Ferreiro hypothesis a “Republican genotype,” which favors policies that promote individualistic behaviors, and a “Democratic genotype,” which favors altruism. “The physiological differences between Democrats and Republicans in fear response, anxiety, etc., are simply symptoms of these competing genetic influences, and not the root cause of their divergent political beliefs,” he writes. The most obvious flaw in this whole line of thinking is its supposition that the political categories it divides us into are, in fact, correct. Are Republicans really supportive of “individual liberty” when they oppose gay marriage, require women who want abortions to undergo involuntary vaginal probes, and support stricter prison sentences? Are Democrats who argue against the government’s right to spy on citizens being “altruistic” and not individualistic? Does the ACLU support the right of Nazis to march because they feel altruistic towards Nazis? What about Bill Clinton, who famously “ended big government welfare” – was that reflected in his genotype despite his being a Democrat? This is nonsense: our political parties don’t fall neatly along philosophical lines. Instead they are a grab-bag of contingent interests and convenient policies designed to appeal to those voters they think are up for grabs. They both appeal to individualism and altruism and anything else you’ve got when they think it’s a winning strategy. You can’t separate them as neatly as Ferreiro would like to separate genotypes. These are also historically contingent: if parties are genetically locked into their political positions by epochs of evolution, then how did the Democrats go from being the party of Jim Crow to the party of Civil Rights? How did Republicans move from being the party that first regulated big business and set aside national parks to being the party that favors corporate freedom over environmental concerns? Did the genotypes change? Again, this is nonsense. The Democrats did not embrace the civil rights movement because they were genetically programmed for altruism anymore than they had supported Jim Crow because they were genetically programmed for altruism. It gets even more complicated when you consider politics cross-culturally. Many conservatives in Europe support universal health care. Many liberals in the Middle East still support religious orthodoxy. Does a liberal Iranian mullah have an “altruistic” genotype because he’s liberal, or an “individualistic” genotype because he belongs to a “conservative” religion? Are these categories even helpful? Whatever the merits of Wilson’s theory, it doesn’t map on to the world we live in the way that explains politics. It not only doesn’t accommodate a world of political convenience and changing minds – it can’t accommodate it. That’s one half of the problem. The other half asks the question: is this even a good theory of evolution anyway? If Wilson’s theory of group evolution is wrong, then the whole underpinning of the idea that political differences are biological also goes out the window. He could be: certainly many of the most brilliant names in biology are lining up on his side too. But would the idea of group evolution operating alongside individual evolution inevitably lead to the idea that individuals have no choice in their politics? My sense, based on his work, is that Wilson would probably say so. But this, too, would be a mistaken application of otherwise good science. 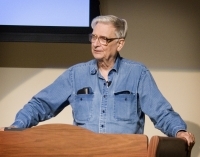 The application of the biological sciences to humanistic questions has been a recent scientific fad – one that Wilson helped launch in the 90s with Conscilience. Every week, some new study comes out claiming that brain science has shown why we enjoy literature or video games, or why we believe in God, or why we love people like us (or don’t). These studies, they tell us, are part of an intellectual movement that’s revolutionizing everything. Yet so far they have had no impact whatsoever on their appropriate fields. The study of literature has been completely unmoved by the “revolutionary” brain studies about reading under an fMRI, and the practice of reading is equally unimpressed. Whether or not they’re true (and the jury’s still out), they are irrelevant to the levels at which we actually care about reading. Brain scans purporting to explain religiosity have likewise had no impact on theology. They’re simply not useful to people struggling with the nature (or lack) of the divine. Study after study purporting to root love in evolution and biology have also failed to make the experience of love any easier, or comprehensible. The neuro-revolution is a bust. Not because its findings are untrue … they may be … but because they are irrelevant. There is a whole area of human experience – a vital, engaging, relevant level – that they do not touch on. That is the level of human choice. The neuro-revolution will have nothing to say about the human experience unless and until it can speak to our experience of making choices. Important ones. By trying to wash the very concept of choice away it always ends up mute. As scientists wonder why they are having such a hard time reaching the broader culture on important issues ranging from school textbooks to global climate change, it may help them to keep this in mind: the entire project of western culture has been based in large part on the yearning for emancipation. Western culture is dedicated to the proposition that we can make choices: that, indeed, our life consists of it. To deny that is to take yourself out of the conversation you want to revolutionize. We will change and we will temper, but we will not go back.